One of the most difficult steps of making a parrilla is the fire. One is to get a good fire, with enough coal and in time. Knowing your guests and family are waiting does not help release the stress on the parrillero. And once you have a good fire, you are set to go, but still looming is the challenge to get fire for long enough to ensure all meat can be grilled. How do you manage that? The first step to get a good fire is actually to clean the fireplace. Why? It is to avoid the ashes and already burnt material to suffocate the new fire. You need to heighten the grill, and remove old ashes and burnt wood and throw it away. Maybe just some wood that still burn, you keep to maintain the fire, but to start, ensure the place is free of ashes. You can use a fireplace or normal shovel to take away the ashes. With fruit crate, far easiest and best way as it puts the coals where you need the fire and without any involvement, and just needs half a page of newspaper. With bottle and newspaper, you wrap the newspaper around the bottle and then take out the bottle, and surround the created paper chimney, take some experience and patience. 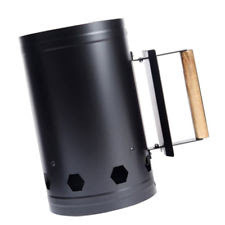 With chimney bucket, special bucket you can buy that has a small fire chamber below, and fills with coal from the top. Needs some experience and effort to do this well. Needs a newspaper and something to burn for longer, like a cloth or old sock. With Brasero, the place where the wood and coal is hanging a little above the fireplace, you burn the coal there and then move the fallen parts to the parrilla, is more effort and you have all coals to the fireplace. Also needs a newspaper and something to burn for longer, like a cloth or old sock. half a sheet of newspaper, just black/white. Magazine paper gives a lot of smoke and should be avoided. Put the coal in the wooden crate, use the little piece of wood to lift up the crate to create a small air chamber and wrap the newspaper sheet inside that chamber, Lighten up the newspaper and leave the fire burn. You do not need to turn around or move the fire till around 25 minutes, when you need to take out the larger pieces of coal aside to the brasero where you can maintain the fire for longer time. After 30 minutes the fire should be ready and you can distribute the coals. The fire should be already be small or non-existent and coals mostly glowing. For any coals that are not yet glowing, you can move them to the brasero. So, it takes just 30 minutes to get the fire burning, so if you want to serve your family and friends, typically count another 30-40 minutes to get the meat done. So typically count one hour before you want to serve with starting the fire. One bag of 4 kg of coal typically lasts for 1 hour after the 30 minutes of getting the fire to start. So if you need more fire, you need more coal that you can put on the brasero. Avoid putting new coal directly on the existing fire, as it will cool down the fire and even potentially extinguish it. To clean the grill, you need to wait till the fire is hot and ready to start the grill, so after 30 minutes once you started. Use a newspaper to take out the worst grease and distribute it. Then take a metal brush, dip it in water, and rinse the grill one or twice by going over it. You can then use a piece of crease of meat to do a final go-over, but not required. The grill is ready now to put the meat on. Happy parrilla!! You can click on the links in the top menu to see other topics how we converted our outdoor space.